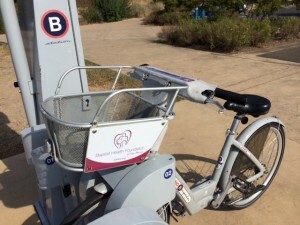 You may have spotted these bicycles around town, like this one seen at Mission San Jose and the San Antonio Housing Authority. BHFSA sponsored San Antonio B-Cycle with a $50,000 grant adding new bikes and bike stations to support health and wellness throughout San Antonio. Users of the program are able to track their mileage and calories burned.